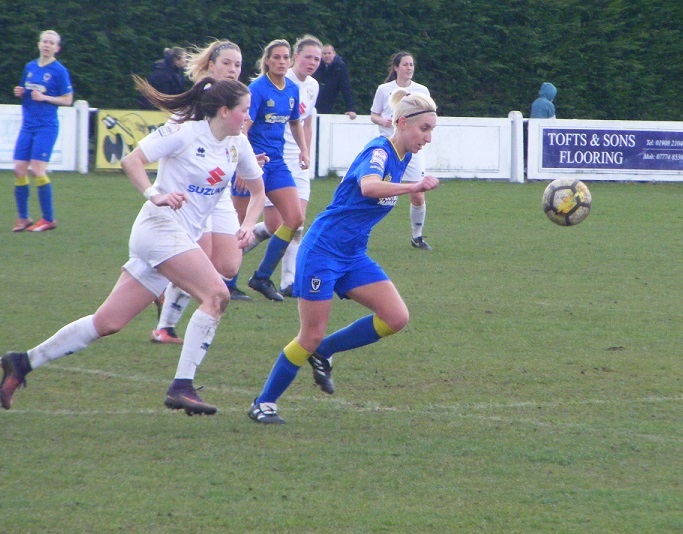 The football action this Sunday afternoon on Women’s Football East comes from FAWPL South East Division One a big game too, with league leaders AFC Wimbledon Ladies travelling to take on 4th placed Milton Keynes Dons Ladies. 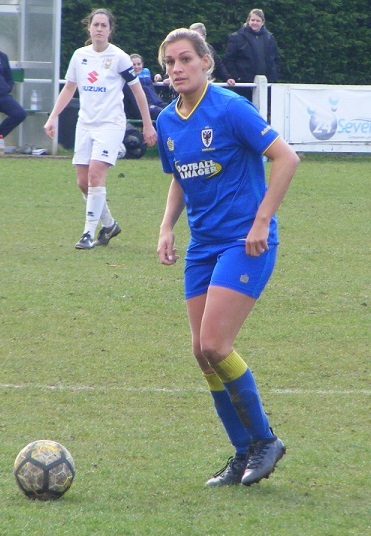 This is my first look at AFC Wimbledon Ladies since they were promoted to the FAWPL two season’s ago. Had a strong debut season playing in South East Division One finishing in 3rd position. Building on that have had a very strong second season at this level leading the table by a massive 16 points with 4 league matches to play. Are within touching distance of clinching the title. Getting their league games played whilst their closest rivals lost fixtures through postponements and cup runs have played more than else in the top half of the table losing just 2 of their 18 league games played so far. 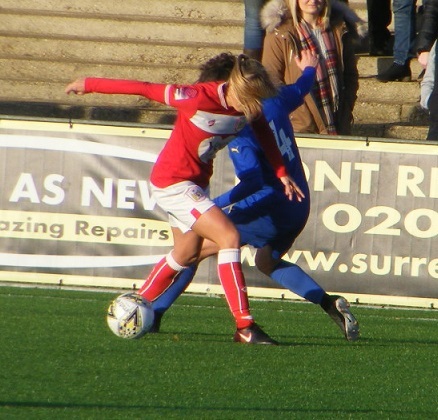 Ipswich Town Ladies and Leyton Orient WFC were both in the title hunt for a good period but have both fallen away. 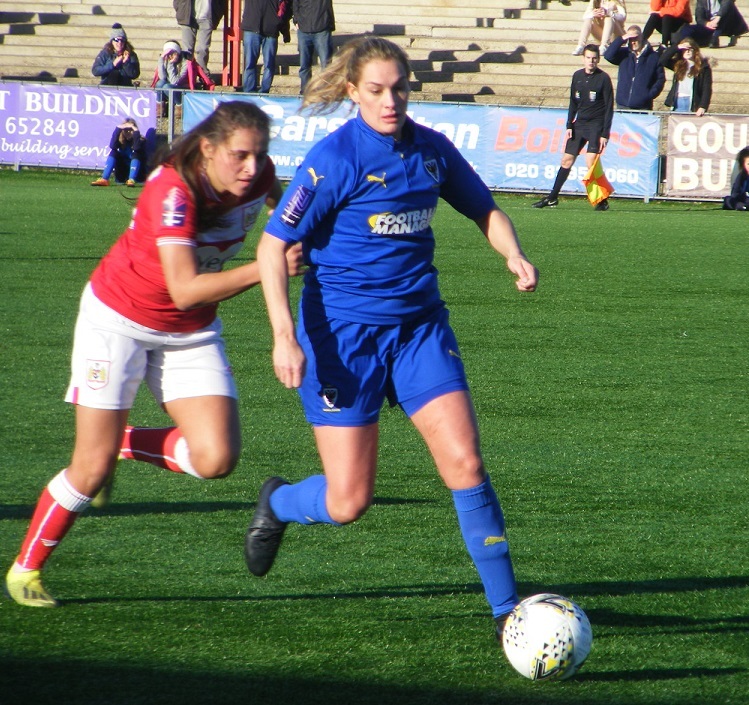 Just one side left that can potentially catch the league leaders now, rivals Milton Keynes Dons Ladies in 4th place in the table have plenty of league games left to play 9 in total and should they claim maximum points in all of those matches they can catch AFC Wimbledon would need to overhaul a +32 goal difference too. 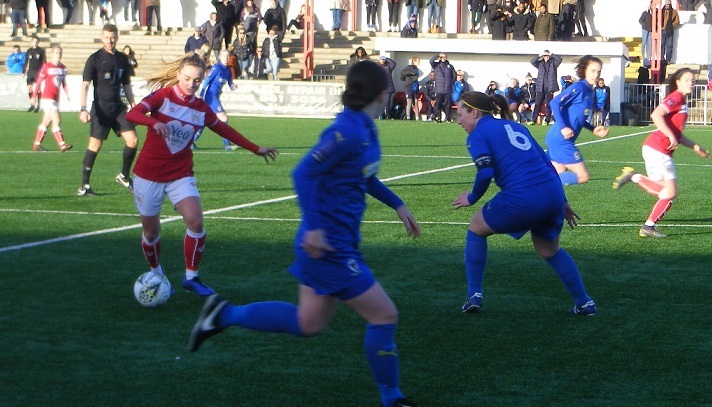 Milton Keynes Dons Ladies have been amongst the top sides in the league for a number of season’s finishing in the top 3 since the FAWPL took over the old South East Combination Leagues 4 season’s ago. One of the strongest sides in the league again this season a tall order to chase down AFC Wimbledon however well placed just 2 points behind 2nd placed Ipswich Town Ladies with 3 games in hand runner’s up spot is definitely there for the taking and with the upcoming changes to the women’s top tiers this summer league placed could yet be a crucial factor of deciding where a side may be come the start of next season. 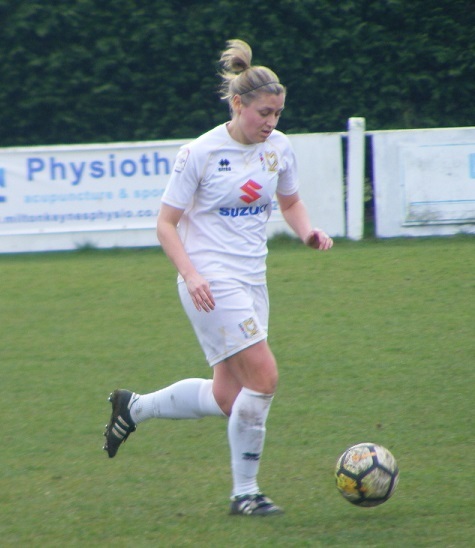 Ahead of the match Milton Keynes Dons Ladies have announced two signings to bolster the squad, striker Leah Cudone returning to the club after spells with Watford Ladies and Leicester City Ladies and Kim Farrow who joins from Luton Town Ladies. Newport Pagnell FC the venue for today’s match the home ground for Milton Keynes Dons Ladies several training pitches around the main ground. A clubhouse and bar beside it. Two small seated stands on either side of the wide pitch. The weather pleasant and sunny for a change at the start of spring March ending far better than it started. A few clouds around but no rain forecast. 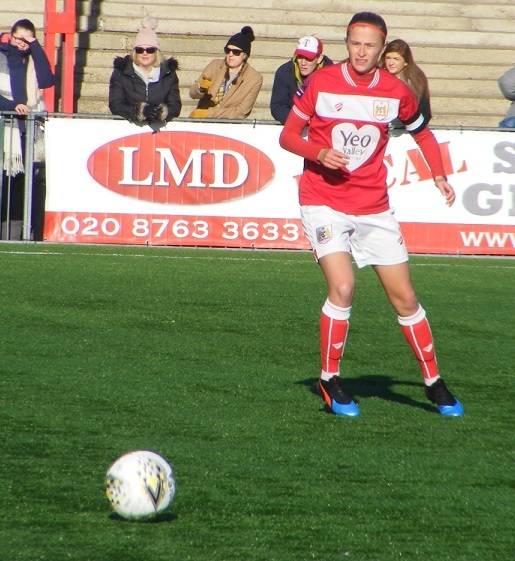 Milton Keynes Dons Ladies starting XI – Sophie Shults, Leanna Doyle (C), Louise Naylor, Sasha Newsome, Vicky Holland, Charley Clarke, Alice Hughes, Charly Wright, Anna Loftus, Heather McDonnell & Kim Farrow. 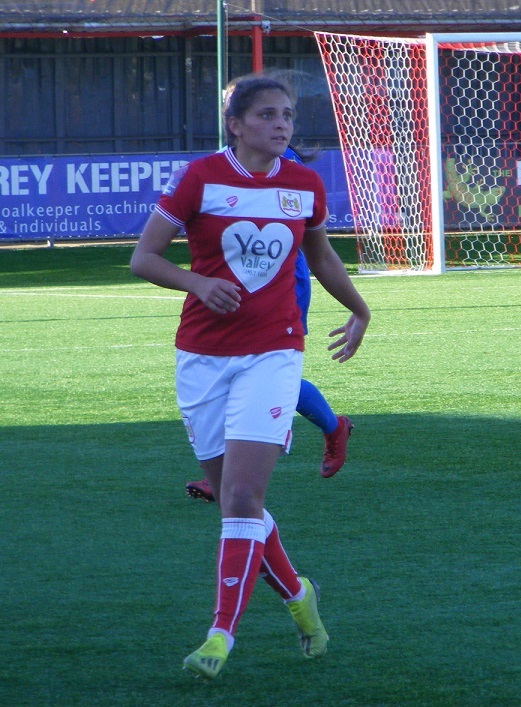 Subs – Zoe Boote, Dawn Mallett, Leah Cudone, Laura Mills & Mollie Burgess. 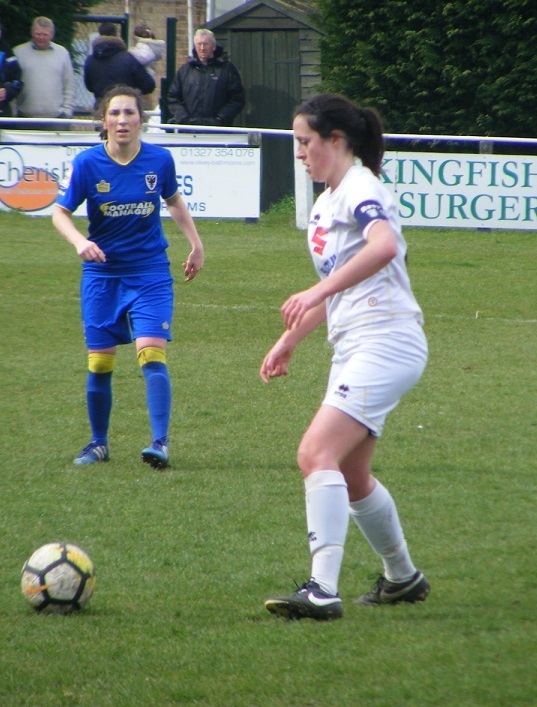 AFC Wimbledon Ladies starting XI – Holly Wright, Sian Wylie, Jordanne Hoesli-Atkins, Jess Trimnell (C), Hannah Billingham, Becky Mclaren-Johnson, Rebecca Sargeant, Laura Quinn-Low, Katie Stanley, Jenny Banfield & Caroline Bisson. Subs – Abbie Measures, Hannah Searle, Kelly-Jade Whelan, Georgia Heasman & Sarah Wentworth. A slightly delayed kick-off due to one of the officials arriving late it’s Milton Keynes all in white to get the 1st half underway with Wimbledon lined up opposite wearing an all dark blue kit with a splash of yellow. A fast start to the game Milton Keynes playing the ball out to their wide players testing Wimbledon down the flanks both sides moving in quickly to close the ball down little time is going to be afforded on the ball. 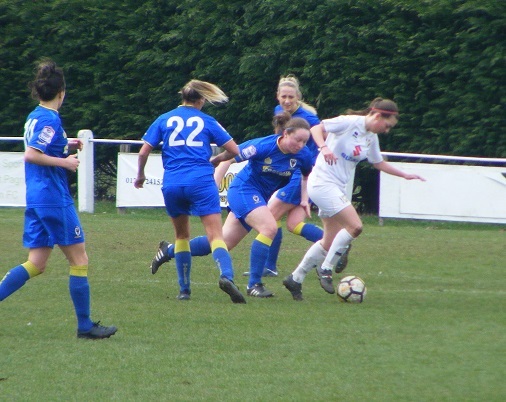 Milton Keynes captain Leanna Doyle finds space on the right side picked out by Vicky Holland at the back going on her attempted cross is blocked by Wimbledon’s Jordanne Hoesli-Atkins. Alice Hughes gets onto the ball centrally inside the Wimbledon half not a lot room tries the through ball for Heather McDonnell getting in behind, Wimbledon captain Jess Trimnell sticking her leg out to intercept the ball. 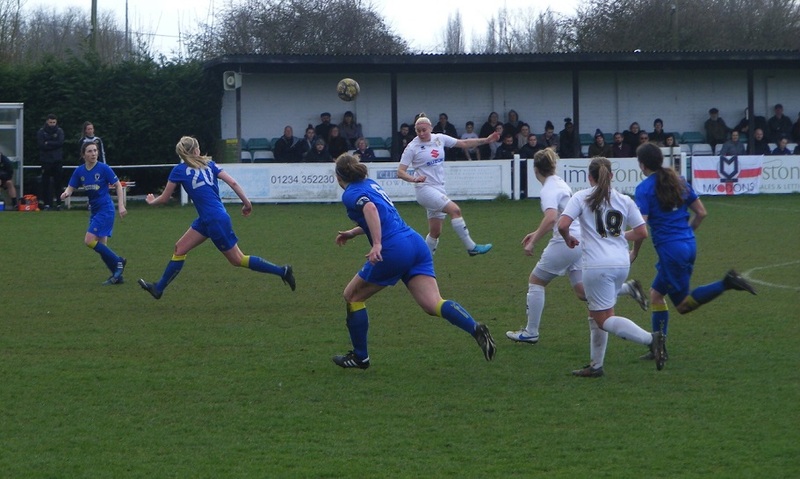 Wimbledon break down the right wing Katie Stanley with help from Caroline Bisson a one two before Stanley looks to play the ball on into the area, Sasha Newsome getting onto the ball to cut out the pass for Milton Keynes. Hoesli-Atkins comes forwards down the left to support Laura Quinn-Low linking up the pair get down into the corner the full back playing the ball into Quinn-Low who chests down well attempts to hook the ball over her shoulder into the area beyond, Milton Keynes can see the ball run out of play. A high tempo to start the match the opening 10 minutes have been busy neither sides has tested the opposing goalkeeper however a determination from both sides not to let either try with one time allowed on the ball the final pass isn’t finding it’s target. Newsome is there to intercept the ball at the back as Rebecca Sargeant through the middle tries to side the ball through for Quinn-Low looking to spring the offside trap coming inside. 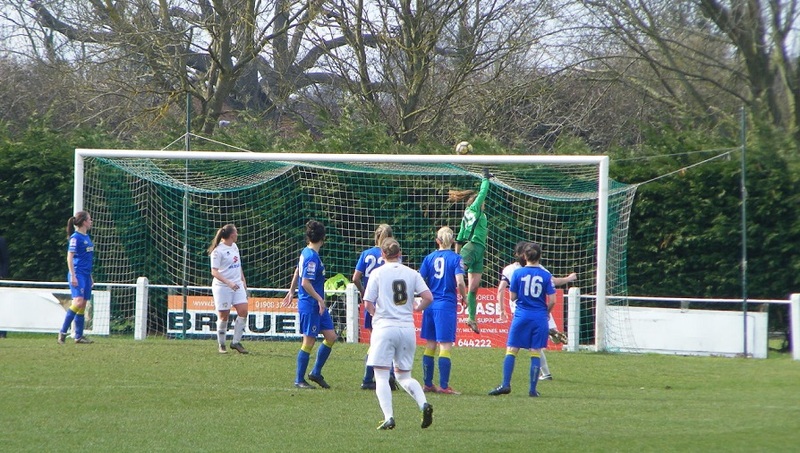 Doyle with the ball at her feet on the right goes forwards, both attackers, McDonnell and Kim Farrow making her Milton Keynes debut come across to support Doyle inside to McDonnell top of the area right side on for Farrow her fierce ball into towards goal cut out by Wimbledon comes back out to Doyle sends a looping ball back in towards goal a difficult one for Wimbledon goalkeeper Holly Wright to deal with back on her line keeps her eye in the ball scooping it out of the air and claims the bouncing ball before anyone can pounce. A free-kick for Wimbledon on half-way players go forwards from the back the ball delivered in towards the top of the area, Milton Keynes don’t get it cleared Hoesli-Atkins running onto the ball sends a high ball back into the area. Newsome under it heads the ball behind to concede the 1st corner of the match, an inswinging delivery Milton Keynes win and clear the ball threaten to break the ball played up to the attackers, McDonnell looking to get away in behind as Farrow opens up her body to slide the pass into her run, the Wimbledon defence quick to shut the door on her. The centre backs for both sides aren’t giving anything away as both sides try their luck through the middle, Becky Mclaren-Johnson on for Jenny Banfield, Caroline Bisson making the forward run getting into the box, Newsome goes with her and regains possession of the ball. Play turned around quickly Wimbledon breaking up a Milton Keynes attack the ball played long with Bisson looking to get in behind, Newsome 20 yards out gets a glancing header on the ball not enough to prevent it reaching the area, Bisson lively after it, Louise Naylor across on the cover from full-back defends well to get the ball back to her goalkeeper, Sophie Shults. A corner for Wimbledon on the right a good delivery from Sian Wylie coming in near post, Shults not getting hold of the ball inside her six yard box, Newsome there behind her to hook the ball high out of the area. 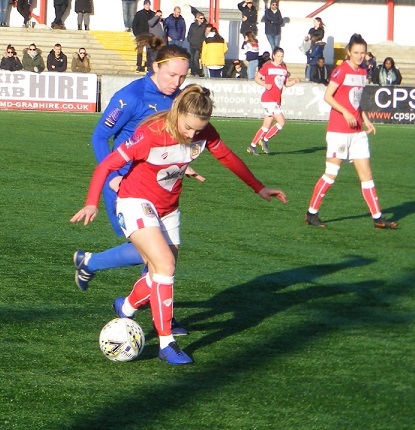 Charley Clarke winning the ball for Milton Keynes on for Hughes, Farrow ahead of her 25 yards out, very congested through the middle no way through, Hanna Billingham winning the tackle for Wimbledon the counter attack bringing a corner, a cluster of Wimbledon players gathered at the top of the area the delivery in towards them Milton Keynes with the knock down, Stanley onto the ball 25 yards out sends a low ball racing in towards goal, Shults back on her line can gather safely. Trimnell with the long ball out from defence picks out Stanley on the move down the right wing Naylor goes with her a slight deflection from the defender as she attempts to stop the cross the ball into the side netting, from the resulting corner on the right the ball comes to Trimnell positioned at the top of the area good head work to get the ball in on goal, Newsome once again with the interception to head the ball away from her goal. A break in play as Wimbledon’s Sargeant is clattered into. A chance for everyone to rest no let up in the tempo the game has a derby feel to it. 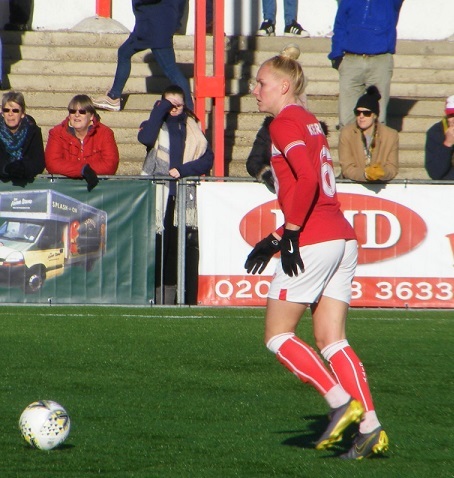 The midfielder is okay to continue play resuming Milton Keynes get forwards on the right, Farrow on the ball running on McDonnell in an offside position catches the Wimbledon defence static as Farrow goes on herself in behind top of the area fires her strike over the bar. 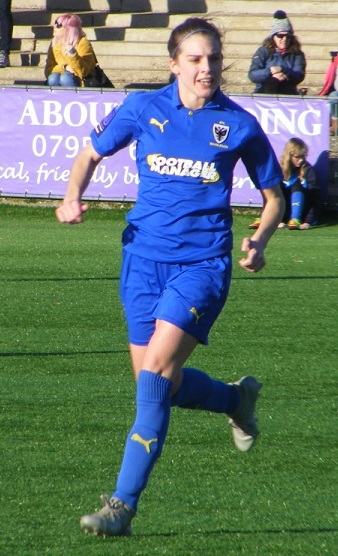 Loftus is shoved over in a dangerous position outside the Wimbledon area as she brings the ball inside from the right, Charly Wright on the set-piece 25 yards out, goes for goal getting the high ball up towards goal dips late but not enough to creep under the crossbar over Wright scrambling across her goal. Quinn-Low with Hoesli-Atkins get the ball down into the left corner. Mclaren-Johnson coming across to receive the ball her cross into the area cut out by Holland. Wimbledon win a corner right side the ball played into towards the top of the area Quinn-Low with the header this time can’t direct on target. Charley Clarke is booked as she brings Quinn-Low down in the centre circle. 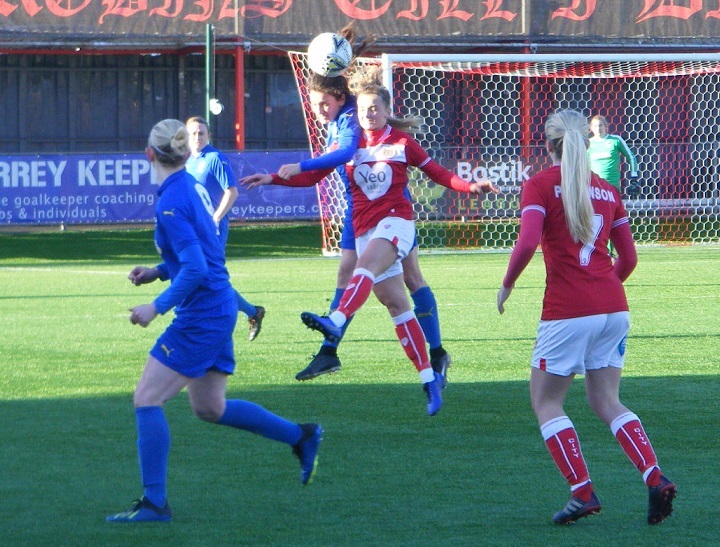 The free-kick delivered into the six yard box, Bisson right on top of the goalkeeper who manages to knock the ball down to the floor, Naylor with the instinctive clearance sending the ball over her own goal. Pinball at times such is the time anyone is being given on the ball, scrappy at times neither side letting the other settle as the referee brings the opening half to a close. A fast pace to the first half plenty of quality players on show however no-one has been afforded any time play squeezed passes rushed and not finding their mark, few chances created and neither goalkeeper with a definitive save to make. 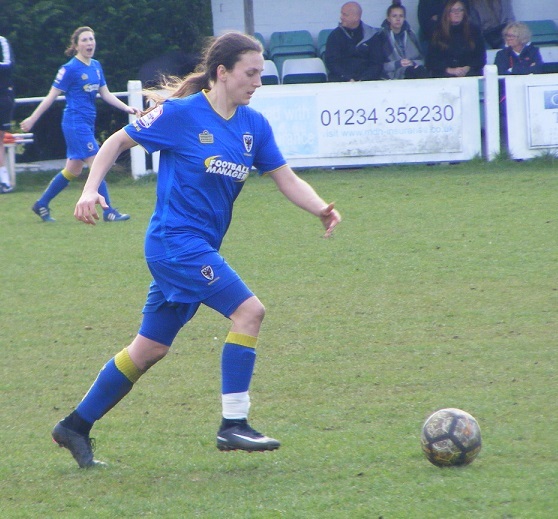 Wimbledon make a change at half-time Sargeant who has been on the receiving end of a couple of knocks in the 1st half replaced by Hannah Searle in midfield. Right from the off the temp of the game resumes Clarke in to win the ball off Banfield. Billingham slides in to intercept as Farrow looks to get in behind. Wylie clearing the ball inside the area as Milton Keynes play the cross in from the right. Wimbledon with a throw-in deep on the right, the ball lost Milton Keynes launch a rapid counter attack the ball played up to McDonnell midway inside the Wimbledon half good hold-up play allowing teammates to get forwards Hughes central given the ball helps it on for Loftus breaking away into the right channel into the area under pressure from the Wimbledon defence fires her shot over the crossbar. GOAL! The stalemate is broken early in the 2nd half another rapid counter attack from Milton Keynes the ball played out to McDonnell wide left deeper this time players are drawn across as support arrives the cross whipped into the area, Farrow with the run gets her head on the ball 8 yards out and sends it past the keeper to score on her debut 1-0. Milton Keynes look to press the advantage get bodies forwards Clarke through the middle plays the ball over the top for Farrow inside the area the ball spinning as it lands takes it away from the attacker allowing the advancing Wright to get her gloves firmly around the ball. Changes for both sides Kelly-Jade Whelan on for Quinn-Low, McDonnell comes off for Milton Keynes Leah Cudone coming on. A corner for Milton Keynes on the left side a good delivery from Wright the ball whipped in across the six yard box, Newsome with a glancing header the ball out the opposite side another corner signalled Wright goes across to the right the ball coming in to the six yard box once again headed down blocked on the line a scramble before Wright lays claim to the ball. 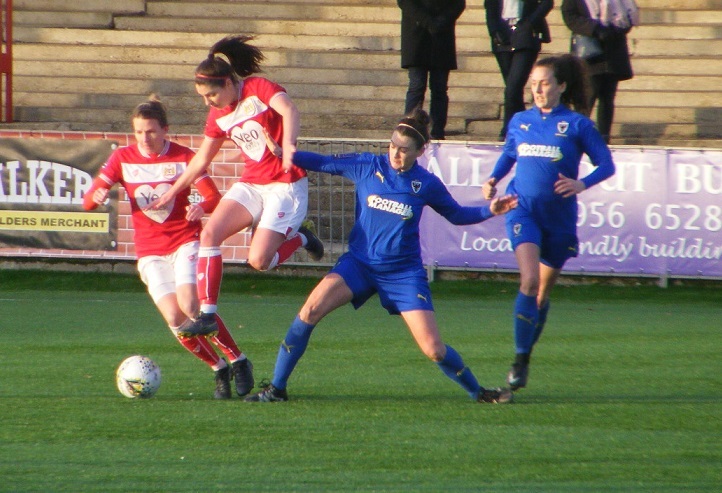 Naylor gets her body in the way to block as Wylie gets forwards to cross for Wimbledon. 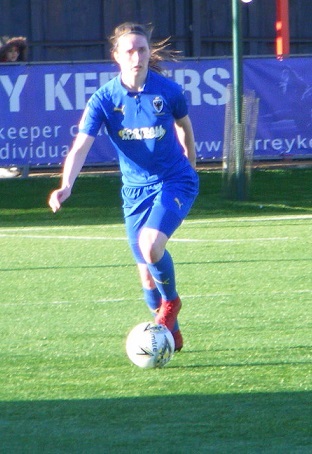 Stanley with the ball on the left for Wimbledon fired in across the top of the area good control from Banfield back to goal pushes the ball out to Searle before drifting right to receive the return pass gets a shot away from 20 yards out Shults is well placed inside her six yard box to gather cleanly. Loftus comes off for Milton Keynes, with Dawn Mallett coming on. Shults comes out to the edge of her area to slide in and claim the ball as Bisson tries to get past Holland. The high tempo to the match is seeing a few tired legs out there a little bit of space starting to show. 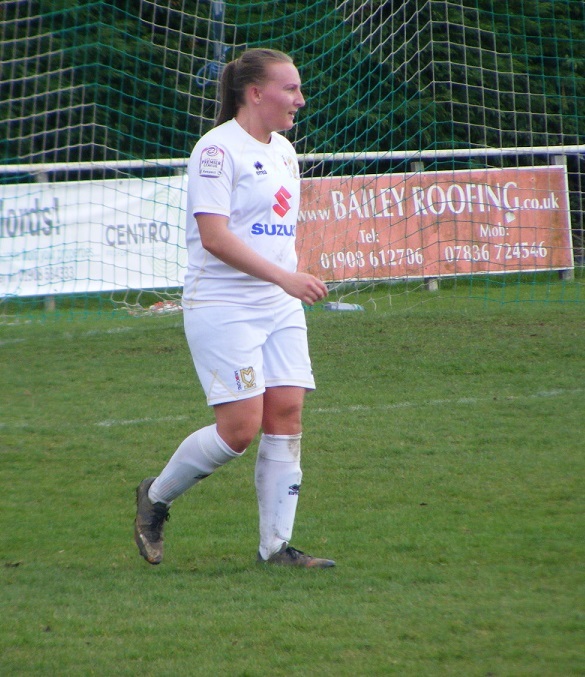 Milton Keynes make their final change, Laura Mills coming on in attack to replace Farrow. Cudone is caught offside as Mallett intercepts a Wimbledon goalkick. 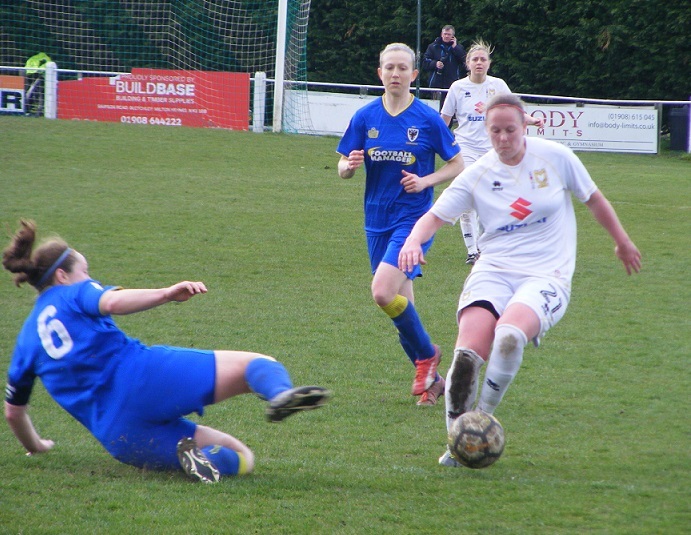 An extra injection of pace for Milton Keynes with the introduction of Mills getting the ball at her feet on the right to the byline her cross cut back into the six yard box Cudone running onto it puts her head into the path of the ball, straight into the gloves of Wright. Another break in play due to injury a painful one for Mclaren-Johnson this time her ankle feeling the full force. The referee issuing a final warning to Clarke. 20 minutes left in the match Mclaren-Johnson strapped up is able to continue. Bisson moves to the right to receive the ball support from Wylie getting forwards down the right wing her cross in headed out of the area comes back to Bisson, hits a lofted ball back in towards goal over hits the stantion behind the goal. A final change for Wimbledon, Georgia Heasman coming on to replace Banfield. A corner right side for Milton Keynes, Wright to play the ball in towards the top of the area, Newsome deeper this time looks to get onto the ball, Clarke is there too ends up tackling her own player. A shot from Wimbledon from outside the box is cut out immediately protests are made for handball the calls ignored by the officials. Pressing late on in the match Wimbledon are far from out of the game counter attacking down the right Stanley plays the pass into Whelan outside the area getting it back on the overlap fires the cross in towards the near post Bisson arriving puts her header narrowly wide of the post Wimbledon’s best chance of the match. 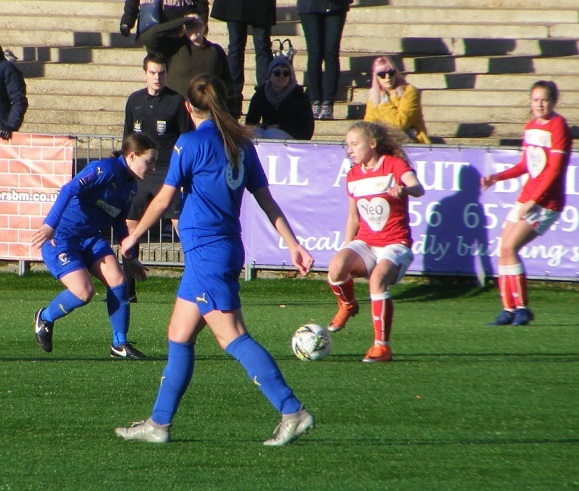 Whelan in the middle again for Wimbledon on the ball out for Stanley on the left puts a high ball into the area towards the far post a difficult one for Shults to deal with does well to pluck the ball down before her defence scramble it away. Cudone is booked late on for kicking the ball away as Milton Keynes counter. With Wimbledon committing more forwards in the closing stages of the match they risk being hit on the counter, the ball long up to Cudone the striker leaps to head the ball on. Hughes sliding in wins the ball sending it on for Cudone her pass out to Mills on the right her cross into the box early, Wright does well to glove the ball away from Cudone racing in at her far post. The game moves into stoppage time. Heasman with support from Searle in the middle looks to release Bisson in behind top of the Milton Keynes area the flag going up against her. Wimbledon with the last attack Bisson finding space on the right help from Wylie a high ball in towards goal Shults deals with the difficult ball as the final whistle goes and Milton Keynes win the match 1-0. Plenty of energy expended in that match from both sides, played at a fast tempo throughout, time on the ball at a premium, little space to be found a committed contest which was only ever going to see a handful of goal scoring chances created. Milton Keynes getting the lead early in the 2nd half, battled to keep it and claim the 3 points. Move into 3 place in the league as a result a point behind Leyton Orient WFC who beat Norwich City 4-1 this afternoon. 4 games in hand on the 2nd placed side however 5 on Wimbledon who maintain a healthy 14 point lead despite suffering there 3rd loss of the season. Still on course to win the title. 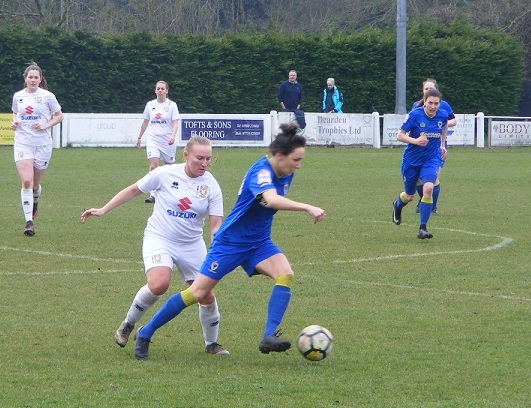 Milton Keynes have alot of games to fit in between now and the end of the season come thick and fast now away to Stevenage Ladies on Wednesday evening. Alot of battling performances out there for both sides this afternoon, so once again it’s a difficult one choosing today’s Women’s Football East – Player of the Match, for the 2nd game in a row however it goes to a player who has collected one before, Milton Keynes Sasha Newsome strong at the back, with some good interceptions and reading of the game, timing of her tackles and not giving the Wimbledon attack any opportunity to get in behind. Nice to watch a game in the sunshine has been a long winter and hopefully April with bring more of the same. An entertaining match two committed sides on display who wanted to give nothing away. My thanks as always to both sides for helping me out with the teams. 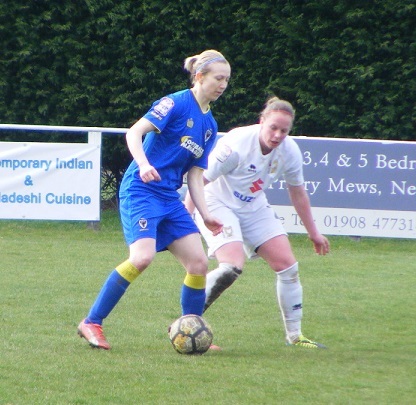 This entry was posted in FAWPL South East Division One, Match Reports and tagged AFC Wimbledon Ladies, FAWPL South East Division One, Match Report, Milton Keynes Dons Ladies on March 26, 2018 by WFEast.